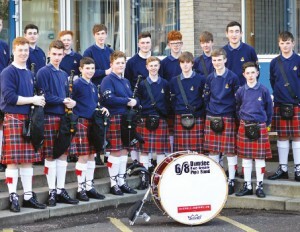 More than 220 young BB musicians took to the floor at the annual Scottish Bands Contest on Saturday 25th March at Hutcheson’s Grammar in Glasgow. This was the first time that the contest had taken place at this venue. Bands participating included: 1st Largs, 25th Stirling (Dunblane), 1st Monifieth, 1st Troon, 4th Dunfermline, Wishaw & District, 1st Tulliallan, 44th Dundee, 6th/8th Dundee and 2nd Port Glasgow. 1st Tulliallan and 6th/8th Dundee clinched the Championship trophies, in the Open and Pipe classes respectively.